(1) “Agent” shall have the same meaning as in [insert state code section]. (2) “Broker-dealer” shall have the same meaning as in [insert state code section]. (b) a person subject to [insert state Adult Protective Services statute]. (ii) Convert money, assets or property of the eligible adult to deprive such eligible adult of the ownership, use, benefit or possession of his or her money, assets or property. (5) “Investment Adviser” shall have the same meaning as in [insert state code section]. (6) Investment Adviser Representative” shall have the same meaning as in [insert state code section]. (7) “Qualified individual” means any agent, investment adviser representative or person who serves in a supervisory, compliance, or legal capacity for a broker-dealer or investment adviser. [i] The decision to affix the age at 65 reflects a desire to maximize the Model Act’s consistency with related proposals that are now being developed by Congress, FINRA, and some state legislatures. As originally proposed, the Model Act would have applied to adults 60 years or older or those adults that would be subject to the provisions of a state’s APS statute. 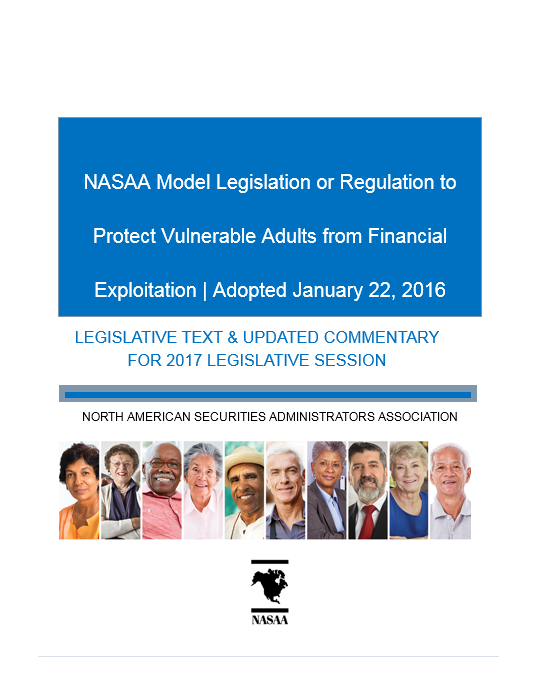 Some commenters suggested adjusting the age to 65 to bring the Model Act in line with other frameworks aimed at protecting seniors from financial exploitation (including existing state definitions, federal legislation such as the proposed Senior$afe Act, and FINRA Regulatory Notice 15-37), and the Seniors Committee and NASAA ultimately agreed. [ii] As proposed for public comment, the Model Act used the term “qualified employee,” however this term was revised in the final version of the Model to make clear that the Model Act does not only apply to employees of a broker-dealer or investment adviser, but also to any independent contractors that may be fulfilling any of the roles described in the definition. The use of the term also reflects the determination that requiring individual agent and adviser level reporting is appropriate given these individuals often have closer relationships with their clients and customers than does any firm or institution. Some commenters suggested that the Model Act limit the definition of qualified individual to only those employees of a broker-dealer or investment adviser that serve in a supervisory, compliance, or legal capacity, arguing that the duties of qualified employees and the decisions qualified employees must make regarding the sensitive issues surrounding potential financial exploitation are better suited for more senior, experienced personnel. Commenters also expressed a concern about multiple reports involving the same vulnerable adult. Other commenters felt the reporting personnel should be expanded. While the Committee considered these comments, the Committee ultimately determined that requiring individual agent and adviser level reporting is appropriate given these individuals often have closer relationships with their clients and customers.